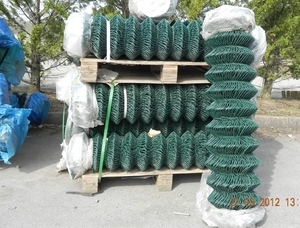 Green PVC coated chain link fencing mesh is a popular fencing option for gardens, boundaries, perimeters and dog runs areas. The wire mesh is galvanised prior to the PVC coating process ensuring the fencing has good corrosion-resistant properties. 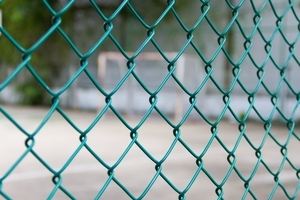 The attractive colour of PVC chain link means it blends in well with the environment. Supplied with 50mm (2" inch) diamond shaped apertures on 900mm, 1.2m, 1.5m, 1.8m and 2.4m rolls. 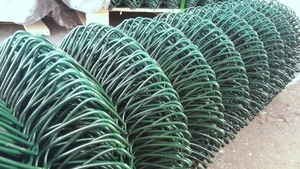 We stock various wire thicknesses and roll lengths to suit different fencing requirements. Manufactured from galvanised steel, the mesh is coated in a green plastic that protects the steel further from corrosion and provides a aesthetic pleasing fencing that blends into the natural landscape. Each roll is supplied with a coil for PVC coated fencing line wire which should be used to tension the mesh at the top and middle to keep the fencing rigid. Available in 5 standard roll widths; 0.9mtr / Approx 3ft, 1.2mtr / Approx 4ft, 1.5mtr / Approx 5ft, 1.8mtr / Approx 6ft and 2.4mtr / Approx 8ft. There are three grades of wire thickness; MEDIUM 1.7mm steel / 2.4mm with coating, HEAVY 2.25mm steel / 3.15mm with coating and EXTRA HEAVY 2.5mm steel wire / 3.55mm with coating.